Very enjoyable stay, really good spot in the city, good staff, good Wi-fi, good bathrooms, good breakfast, good beds. This was a lovely place to stay. Great location, helpful staff, good breakfast. The room was nice, we were given a heater as it was winter which really helped. The shower was probably the best we have come across in 3 months. The WiFi worked well. The kitchen was good. The only comment I would have is - if there is a need to put your toilet paper in the bin, it would be nice if it was emptied once a day or larger bins were accessible. All in all I would definitely recommend this place. Location was amazing because it was in the Cerros (so amazing views), and is pretty much the area where the free walking tours take you. Facilities were great, and breakfast was good. Love the one bed style in the rooms. There weren't a lot of toilets, but when we were there, there wasn't a lot of people so it was ok for us. Really nice breakfast for sure, with fresh fruit. Staff was nice and helped with any questions I had. Location is definitely top notch. As others have said, not much of a social atmosphere but that was fine for me. Bit cold on the rooms but great location. Ideal for a night or 2. 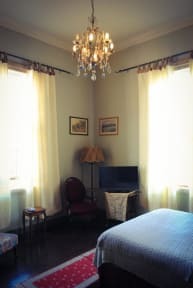 I enjoyed my stay at La Colombina and would recommend it to anyone looking for a good place to stay in Valpo. I liked the location a lot and there were some delicious food options nearby. Also, the staff was super kind and I enjoyed sitting by the fire reading a book. The only drawback was that I was the only person in my dorm (though for some this could be a plus) and the dated decorations made it a bit creepy. The window was also loose and it slammed in the wind making it hard to sleep. As other reviewers have said, this hostel is somewhere between hostel and hotel, so there is no common space to hang out in and not much backpacker atmosphere. That was fine for me for staying only one night, though might have not been great for a longer stay. The facilities were quite nice and the beds were very comfortable, but there was no heat in the building in the middle of winter, and our four-bed dorm got really cold at night. The location was perfect, however, and breakfast was great! The hostel is a HUGE old 1900 building and so the ‘superior’ private ensuite room was located in a different building to the reception and was FREEZING cold as the building was so old, wooden floorboards, broken single glazed windows. Shower was intermittent with freezing cold and hot water. Sheets, towels and even bins didn’t get cleaned or emptied over a 4 night stay. Breakfast was decent and only good feature really. For the price paid being in Concepción, very very poor hostel and room!! !